Born and educated in New York, Roy Lichtenstein served in the army during World War II. In 1945, he attended Ohio State University, where he later taught. In the 1950's Lichtenstein painted in a style derivative of Abstract Expressionism, with subjects that ranged from reproductions of famous paintings to commercial illustration. In 1960, he moved to New Jersey to teach at Rutgers University where he met fellow teachers Allan Kaprow and George Segal. 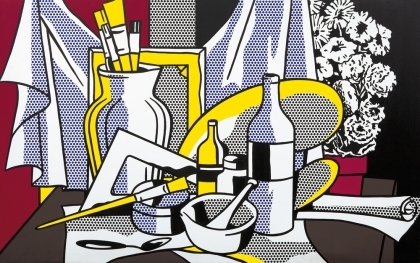 Lichtenstein, along with Andy Warhol and Claes Oldenburg, was a pioneer figure in the American Pop Art movement, which celebrated popular and commercial imagery. In his trademark cartoon paintings begun in 1961, Lichtenstein enlarged and edited the single frame of a comic strip, either romance or action subjects, including the talk balloon, the simplified back outlines, and the dots used for printing color. Throughout the 1960's and well into the 1990's, Lichtenstein consistently applied these conventions to a wide variety of subjects including the work of artists such as Pablo Picasso, brushstrokes, mirrors, still lifes, etc. He reproduced not only the subjects of the mass media such as comic strips, advertisements and consumer items, but also the appearance of mass media.